Sometimes, it is just time. Time to move! 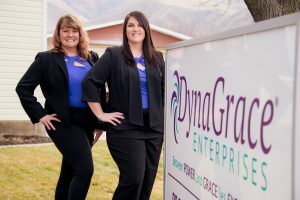 DynaGrace Enterprises has moved out of a home-based office into a commercial building in Morgan, Utah. 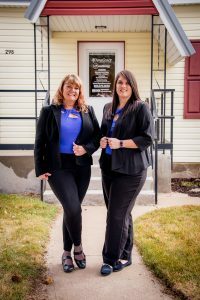 We have determined our growth opportunities need a storefront, and for other legal and regulatory reasons, we moved into a beautiful, rural, commercial, building that allows us to be more successful. We love having a place where prospective clients routinely visit to make a decision to purchase our services. We feel we are definitely more professional in a commercial office. We were limited on space for doing the services that we really want to do such as website design, publishing books, STEM activities for children and a podcast studio. And well…after 12 years working at home it was time to be more productive in a different environment. Focus and staying on task are the theme for DynaGrace Enterprises in 2018. Physically leaving home to go to an office helps us be more efficient and produce more. We have a pure team environment now with Jennifer Remund, Machelle Lowry and myself, Linda Rawson collaborating on upcoming projects. We have already jumped into the business community by attending Women In Business events put on by the Northfront Business Resource Center. We participated in the first-ever Festival of Trees put on by the Morgan Chamber of Commerce. 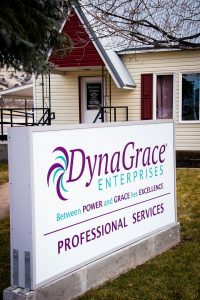 We have a singular mission, and that is to make DynaGrace Enterprises a Women-Owned, rural, powerhouse for professional business services. We are an example of the less than one percent in the State of Utah, and we are here to stay and prosper. The new address is 298 E 300 N, Morgan, Ut 84050. Our hours are Monday through Friday from 9:00 AM to 4:30 PM.